Powers/Abilities: Able to reverse or speed up evolution in any living thing, although the power is difficult to control and the results unpredicatable. History: Philip Fetter was an innocent man who was haunted by the Runesmith, a psychotic spirit, which constantly whispered in his ear, driving him to murder random victims. After nearly killing his own father, Philip tried to commit suicide by drowning himself in a river, only to be rescued from a watery grave by a woman called Regina. However Philip was unable to resist the Runesmith's urgings in his weakened state, and slew his saviour, an act with unforeseen consequences. Regina was an angel, and as her body spontaneously burned to ashes, her life force entered Philip, trapping the Runesmith within his soul with it forever. Now Philip housed two very different and conflicting spirits, granting him unusual abilities, and ending his old life forever. 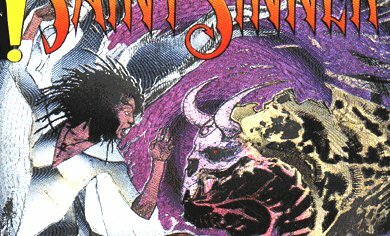 He became Saint Sinner, patron saint of lost souls, wandering the world trying to use his new abilities to aid those in need, constantly fighting the darkness and desire to commit evil now resting within his soul. 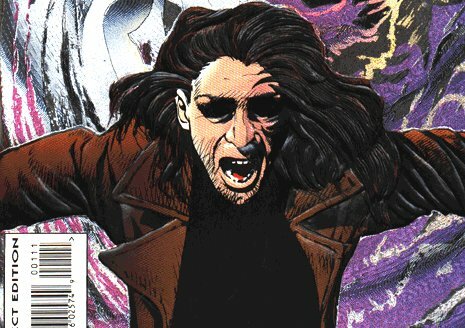 In 2002 Clive adapted the concept, if not the actual character, of Saint Sinner to make the story into a TV movie. Very little of the original version seems to have survived to make it to the screen.